Fresh out of the oven. Tablets with 10.1-inch display, NVIDIA Tegra 3 and Android 4 (aka Ice Cream Sandwich) are almost a dime a dozen now. Can Acer's Iconia A700 Tablet stand out from the crowd? The Acer Iconia A700 Tablet has been excitedly awaited by the tablet community, and in the past Acer has proven to us the quality of their tablets. For example the Iconia Tab A200, that left a good impression in our test lab. Back then we were impressed by its performance, quality and battery life, also the fact that it was offered for a very fair price. This is also the case for the current Iconia A700 tablet. For 449 Euro (~$588) you receive a modern tablet with a big 10.1-inch display, utilizing a pleasing 1920x1200 pixel resolution. However, in terms of key specifications, Acer cannot separate itself from the competition. 32 GB of internal memory, one GB of RAM and NVIDIA Tegra 3 SoC with four grills and one power plug to the side, are in tablet-terms fairly standard. For now Acer has dispensed with 3G. 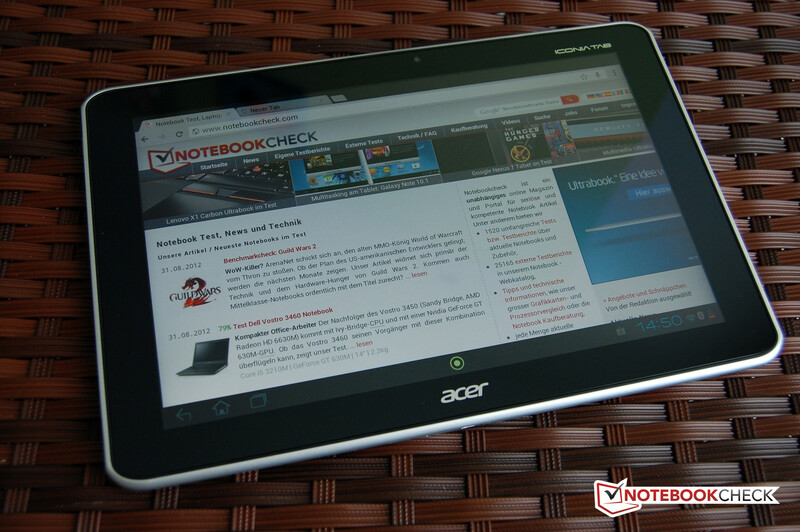 The question is can Acer's A700 tablet still prevail over some very strong competition from Asus, Fujitsu and Samsung? On paper Acer has developed at least one distinct advantage in regards to screen resolution. The Acer Iconia A700 tablet is not the slimmest around. Not much has been done to the housing of the Iconia A700 Tablet in comparison with the A200 and A510 models. On the contrary, the manufacturer continues to utilize a plastic housing with a rubber base, which has numerous small knobs. Thus, the tablet fits conveniently and securely in your hand. The tablet is available in black and silver, like our test model. The back of the silver model provides a beautiful contrast to the dark front. In all black, the device is timeless, albeit a bit conservative. The experience is however dampened by the relatively heavy weight of 685 grams (1.51 pounds) for a 10.1-inch tablet, especially considering the lack of a 3G module. When compared to similar competition, such as the Fujitsu Stylistic M532 or the Samsung Galaxy Note 10.1, this is just too much. It becomes apparent when you try to hold the tablet in just one hand, making it hard to say this device is comfortable. The build quality is generally superb, but the materials used could be of a higher grade. The tablet is not going to feel at home in your hand. 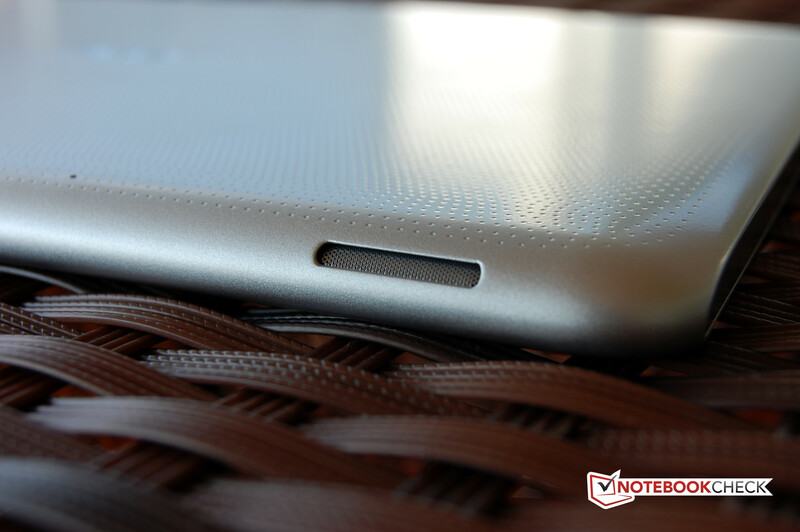 In favor of fine tuning, the tablet has been created with no gaps or sharp corners/edges. With length and width dimensions of 260 x 175 mm (~10.2 x 6.9 inches), the Iconia A700 is quite compact. The height of eleven millimeters (~0.43 inches) would allow you to call the tablet somewhat chubby by today's standards. What is quite interesting with the Acer Tab is that the power cable, which plugs into the USB charging port, is angled so that it is not at a right angle to the lower housing frame, but rather parallel to it. This means that the risk of the cable accidentally breaking or being pulled out is minimized. Furthermore, this makes it a lot easier to use the tablet while it is charging – as long as the mains power is to the left of you. Despite the relatively thick and heavy body, the Iconia A700 delivers just an average amount of stability. You can hear a creaking noise from the rubberized backing with a low effort twist of the tablet. However, the stability of the scratch-resistant front glass leaves nothing to complain about. In terms of features, Acer can't surprise us with their newest tablet - at least not much. The high resolution of the screen definitely deserves a closer look, but we will get on to that later in the review under 'Display'. Acer is using an already proven processor, with previous tests showing good results. The SoC NVIDIA Tegra 3, which handles the T30S version, clocks 1.3 GHz with the A700 tablet. If only one of the four cores is used, the clock speed has a maximum of 1.4 GHz. Because of this Acer had to resort back to a more conservative version of the Tegra 3 chip, similar to the Fujitsu Stylistic M532. Manufacturers such as Asus, with their Transformer Pad TF700T Infinity, are focusing on the strongest expansion with up to 1.7GHz. Graphics performance is optimized with the SoC integrated NVIDIA GeForce ULP. This should clock 520 MHz. In regards to memory there are no surprises. One GB of RAM is adequate to run a full-sized tablet. This also applies to the internal storage of 32GB, which can be expanded cheaply with the use of a microSD card. The other features are also good. We were pleased to find that Acer included a full micro-HDMI interface and not just an adapter solution for the multi-function port. Many other manufacturers do this, and it just creates additional costs. Two cameras are also on-board the device: the front has a 2MP sensor, and the back has 5MP. The fact that there will be a version with 3G capability is already known due to the Wi-Fi-only version's existence. Beneath the cover of the microSD slot there is another slot for a SIM card, but this is sealed with plastic. The 3G version will be named the A701, but prices are unavailable right now. The use of Android 4 (aka Ice Cream Sandwich) by the Iconia A700 tablet creates a young, although not fully current operating system. However, this shouldn't be taken as criticism. Android 4 is doing well as a now mature OS for tablets and smartphones. The Android version of the Acer Tab is 4.0.4. Android update 4.1 (Jelly Bean) has already been announced to arrive on Acer sometime later this year, at the latest the first quarter of 2013. 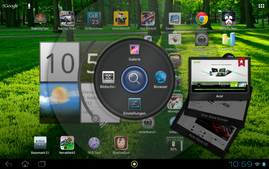 The interface of the Android system is called Acer Ring UI, and is virtually unchanged in this case. 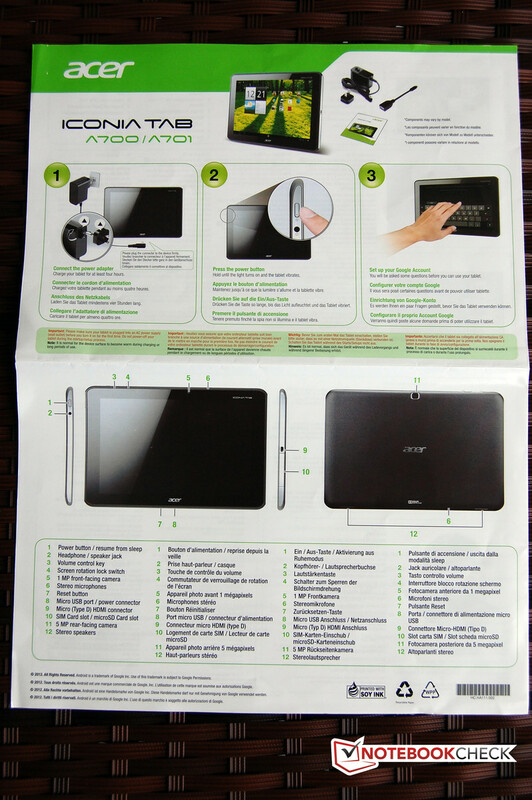 To access the menu ring Acer included a specific 'button' which is located centrally at the bottom of the screen. With just one tap on the button it opens up the ring in the middle of the screen – after a short delay. Acer brings such features as screenshot, volume control, four free selectable apps and many websites to the ring, all of which you can scroll through with your finger. In the middle of the ring Acer offers a system-wide search function. The Idea behind the Ring UI is good and controlling it works intuitively. Because of the slight delay in bringing up the ring, it's usually faster to simply access things from the menu. The Ring UI can totally disable the menu. Various apps are already installed on the Iconia A700. These include Polaris Office, the music program 7digital, Acetrax Movies, Games Real Racing 2, HW Solitaire and Monopoly. Overall this is a nice and somewhat useful mixture. Like any Android tablet, the Acer Iconia A700 tablet has a GPS sensor installed so the device can function as a portable GPS, or can mark images with corresponding geotags. Establishing the initial location from the satellites lasted a comparatively long two minutes in our test. The accuracy was seldom less than 10 meters in open space. Therefore the GPS function is less than optimal. 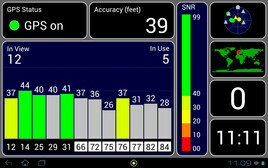 For street navigation the accuracy is adequate, but the critical side would be its use in thick forest or in narrow areas. The Acer ring is the central element of the user interface. 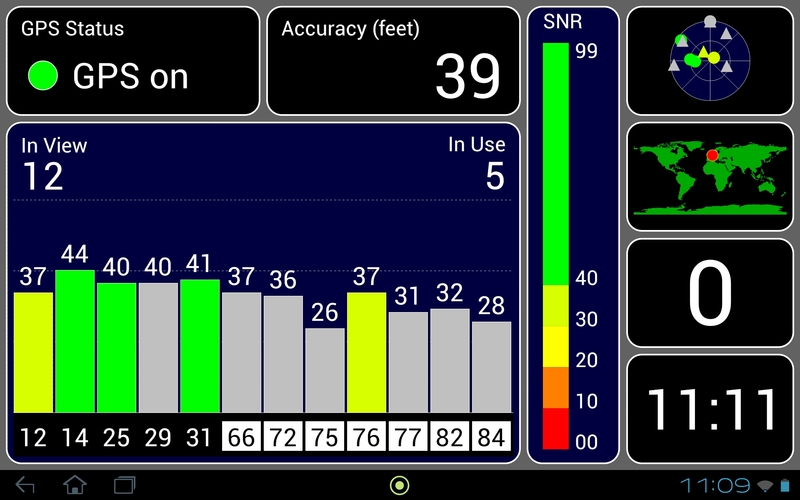 The GPS test verdict: not optimal. In regards to camera resolution, Acer shows some restraint when compared to other manufacturers. The front camera shoots at 1280x720 pixels, which is just below one megapixel. The pictures taken by it really only deserve one grade: useless. The photos are severely over-exposed and very blurry. Even worse, a clear blue tint is visible on the photos. The rear camera shoots drastically sharper images. The blue tint and excess light can't impede the 5-MP lens. Overall the Acer Iconia A700 tablet is not made for great photography. Even if it is just a snapshot for Facebook or other social sites you will need some courage to upload them. Obviously the Acer Tab can also record video. The front camera shoots in HD quality with 1280x720. This is more than enough for video calls, but the image quality is not very good. The reverse camera offers shooting in full HD with 1920x1080, which creates far better overall results. With changes between light and dark the camera adapts well, but diffusing ambient light can quickly lead to grainy quality. Playback of movies on the tablet is great fun. The user benefits greatly from the high-resolution, rich colors and fairly good viewing angles. There are also two Dolby Mobile-enabled speakers, which have earned their place on the tablet, being able to produce clear sound even at high volume. You can customize sound settings through the menu to tailor to your own personal taste. Action-packed movies are also available on the Iconia A700, providing a real experience. 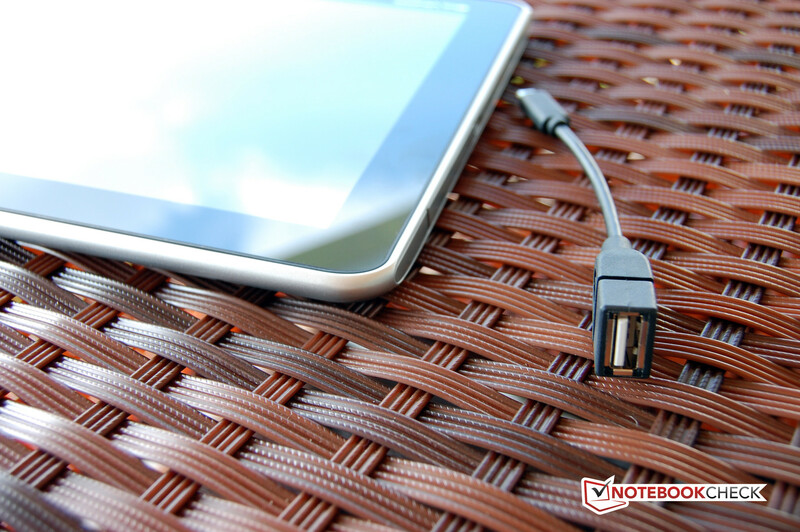 There are two things worth mentioning when it comes to the Iconia A700 tablet's accessories. 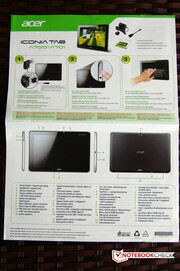 Firstly, there is a large colored leaflet in the box which explains the basic features of the tablet clearly. The other thing is an adapter from micro USB to a normal USB. This could be connected to a mouse, keyboard or hard drives. Results from our test show these have good functionality. We connected a Logitech USB mouse to the tablet and it was recognized and usable immediately. Even the scroll wheel worked fine. We also connected a USB powered hard drive, which worked problem free through the tablet's USB port. For an extra price, Acer offers a matching case in black and gray at 29.90 Euros (~$39). There is also a Bluetooth keyboard for 49 Euros (~$64), a screen protector for 12.90 Euros (~$17) and a stylus for 16.90 Euros (~$22). This chapter on the Acer Iconia A700 is rather short. According to the manufacturer's website, the tablet has a 'standard warranty'. This means you get 12 months, without the option of upgrading. 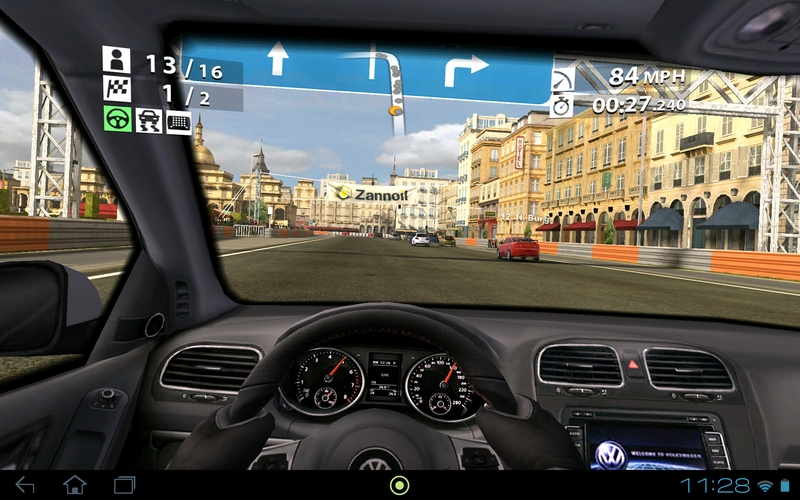 The previously tested tablets with NVIDIA Tegra 3 SoC and Android 4 didn't have any problems running current 3D-games. However, the Iconia A700 tablet is together with the Asus Transformer Infinity TF700T in being the only 10.1-inch device with a 1920x1200 pixel resolution. The high-resolution stresses the integrated GPU a lot more than other devices in the same class with 1280x800 displays. In comparison to the Asus-flagship, the Acer Iconia A700 is clocked a lot slower. This can only be seen in rare cases. So it will only be graphic-intense games such as ShadowGun or Real Racing 2 HD that will force random short stutters. Luckily this shouldn't ruin the flow of the games. On a forum it would be more normal to read of far more troublesome performance problems. This involves a minor Android release: 4.0.3. Also, the operating software on-board could be allowed to be an older version. We didn’t notice any serious problems at all when using our test model. The precise and responsive touchscreen combined with a well-functioning positioning sensor makes gaming a real pleasure on this device - especially when in co-operation with the great sound output from the two speakers. The high resolutions runs at the expense of performance. Current games will still work well. The tablet runs on Android 4 (Ice Cream Sandwich), and there's not much more to say. The touchscreen works successfully interpreting your commands. Except for the obligatory power switch and volume rocker, physical keys are not present. 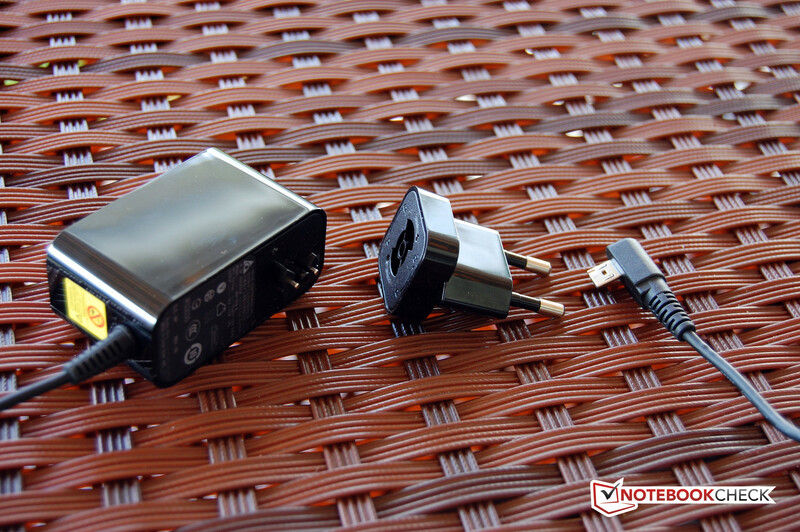 Acer also employs an extra sliding switch on the upper edge next to the volume control. This is there to turn on and off the automatic turning of the screen. The volume control is just a couple of small buttons that look a bit like a Braille keyboard; One button for louder, and the second for quieter. The rather small power-button is located at the top left, along with an LED that indicates the device's status and whether or not it is charging. Acer didn't change much to do with the Android-OS, which is a good thing. The virtual keyboard functions flawlessly, even when used by someone with large fingers. Overall, we don't think the controls are going to puzzle anyone. The Ring-UI is nicely done in the end, but is really only going to offer moderate additional benefits. Generally speaking, working with the Acer Tab flows well. The only small jerks you may experience come from scrolling through long websites. Sometimes you may also see the page sharpening its image, although this will only be a matter of split seconds. 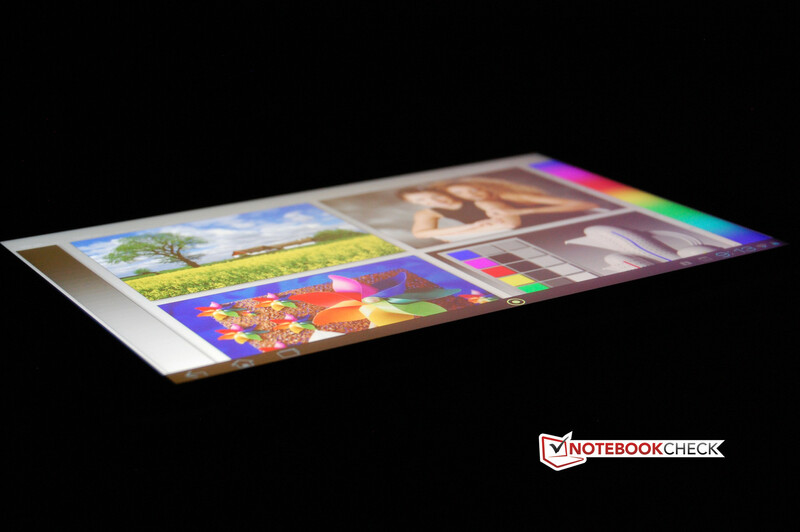 Nevertheless, tablets like the Samsung Galaxy Note 10.1 or the Fujitsu Stylistic M532 will run just a little bit smoother. We were especially looking forward to the full bodied and much talked-up 'Full HD Display' on the Iconia A700. However, with a resolution of 1920x1200 pixels, it is not really Full HD - at least not by technical definition. We have simply dubbed it as such for the simplicity of saying a high-resolution. The format of 16:10 is standard for today's tablets. For display technology, Acer gives us their in-house AHVA-tech. According to the manufacturer of IPS-technology this should be very similar. The touchscreen rests under reflective glass. The test results of the screen come in a bit mixed. The maximum brightness of 289 cd/m2 falls short, being rather close to the average tablet brightness of 277 cd/m2. In comparison, the Asus Transformer Pad Infinity TF700T and the Fujitsu StylisticM532 are setting the bar with around 600 cd/m2, making them significantly brighter. On the other hand, the illumination of 93% is close to perfect. The contrast of 660:1 is good, but still not the best in its class. The black level of 0.47 cd/m2 is simply not safe. The lack of brightness is once again a decisive factor here. 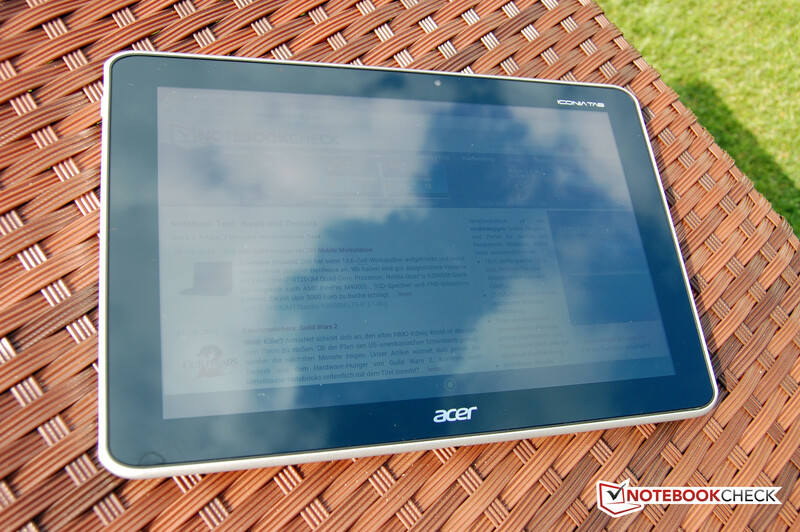 We think the color reproduction of the Acer Iconia A700 tablet is good. Color tone is true to life and strong. Color shades are also easily recognized. Rich blacks mean that pictures and films have great contrast. Subjectively, there is nothing to complain about with the picture quality. With outdoor use, we have to complain about absolutely everything. Not only does the display provide a poor amount of brightness, but the glass screen reflects light in a way that makes it hard to recognize anything - even in the shade. This severely narrows the potential uses of the tablet, especially outdoor use. Even lamps or other light sources are capable of creating annoying reflections. We seldom see such heavily reflecting glass in any of our tests. Acer talks about a panel similar to the IPS. In reality we can hardly identify a difference worth mentioning. The colors stay rather stable when viewed at flat angles, only the contrast is compromised. 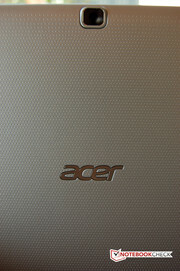 The bottom line is that the Acer Iconia A700 holds up well in this part of the test. As we have already mentioned, Acer is sitting on the top of the heap with the Iconia A700 tablet when it comes to SoC and memory configuration. With the NVIDIA Tegra 3 and one GB of RAM, all tasks should be handled without trouble. Nevertheless, the relevant benchmarks of performance show that the high-resolution display is a burden on the tablet's performance. In other words, the tablet needs extra performance to deal with the display. The Acer will have to beat the relevant high-class competition in regards to performance. Considered alone, the performance is undoubtedly high. But in comparison the Acer seems to be under restraint. To show the loss of performance is due to the display, GLBench 2.5 revealed that in the off-screen test the Acer can easily keep up with the competition, performing very well. In contrast, the on-screen test showed that the native resolution forces the Acer to take a sharp fall backwards. Other graphic-intensive tests such as AnTuTu or NenaMark reinforced this idea. The Asus TF700T, with identical performance, shows the exact same phenomenon. In this case the higher clock-speed of the Asus means that it fairs slightly better. It is possible to notice a slight lag to the top-scorers in regard to the AnTuTu tests of RAM and Database I/O. It is likely that Acer used comparatively slow DDR2-memory, which would explain the lag behind Asus' faster flagship. The internal memory is also not the fastest. The results of the Database I/O test show that the Acer Tab performed up to 40% worse than the best devices in this class. In everyday use you are very unlikely to notice any lack of performance. The only thing you will have to accept is the occasional lag while playing demanding games or scrolling through large pages. To measure the device's thermal design we measure the temperature at 9 different surface points on the tablet - in idle mode and under full stress. The latter being tested by our Stability Test app. In everyday use the Acer Iconia A700 tablet is not noticeably warm at any of our test points. However it is still not going to be our coolest tablet yet, with a maximum of 36.2 degrees. Typically things start to look a lot different when we start our stress test. We measure quite high temperatures on the right side from front to back. The right side of the back is especially hot, measuring in at just less than 50 degrees. (-) The maximum temperature on the upper side is 47.8 °C / 118 F, compared to the average of 34.8 °C / 95 F, ranging from 22.2 to 51.8 °C for the class Tablet. 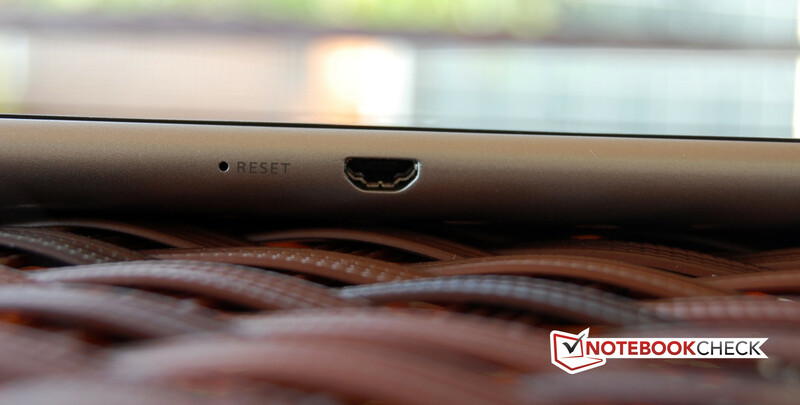 We have already mentioned that the speakers decidedly earned their place on the tablet. The positioning on the tablet on the bottom rear edge, where the tablet is slightly slanted, was well thought out by Acer. Even if the tablet is lying flat on a table the sound can be heard unimpaired and is not at all dampened. Especially for a tablet, the sound of the two small speakers is very good. Thanks to the support from Dolby Mobile you can even optimize playback to your particular taste. The inbuilt mini-box works easily with movies and games, creating a bit of fun. Anyone who really wants to listen to music will of course not be able to bypass the option of headphones. Although the middles and the highs are clearly separated and the sound is clean, for real crisp bass and good sound body the speakers won't be enough. Tablets are by nature among the most efficient mobile devices when it comes to power consumption. Despite modern quad-core CPUs with 3D-capable GPUs, power consumption and battery life are very rarely criticized. With the Acer Iconia A700 tablet this starts to look a bit different. While the power appetite is not a huge issue, it is still in the frame, and certain pieces of data from these tests are conspicuous. But first things first. With a good 36 Wh rating the battery of the Acer Tab is comparatively big. The capacity of the Lithium-Polymer-Battery is an ample 9800 mAh. This large battery is necessary, as it soon becomes evident how much power the Acer Tab uses even when idle. With a lowest power consumption of 5.3 Watts while on the lowest brightness setting and all communications disabled, this tablet does not score well. In comparison: the Fujitsu Stylistic M532 stays 0.6 Watts under the lowest consumption of the Acer, even with an identical display running on a higher brightness and all communications activated. In an average day the power consumption should level off somewhere around 7 Watts. Under full stress in the Stability Test, the power consumption is quite limited, not exceeding 10 Watts regardless of what we throw at it, making it rather economical. While testing the standby power consumption our meter was producing results up to five Watts. Even when we left the device in standby mode for several hours we saw no decline in battery power use. Because of this we have made the decision to leave this particular stat out of the test and think that it should be disregarded. 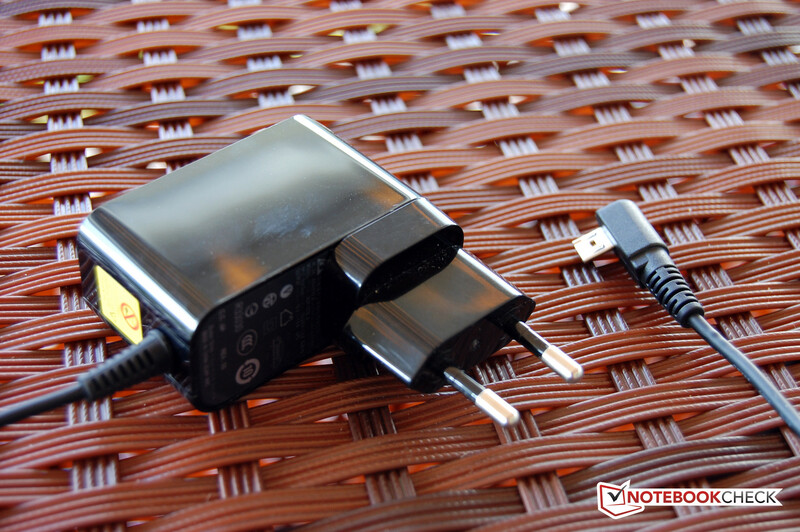 For a full battery charge the 18 Watt power supply needs about 3 and a half hours with the tablet in standby mode. This is all right. 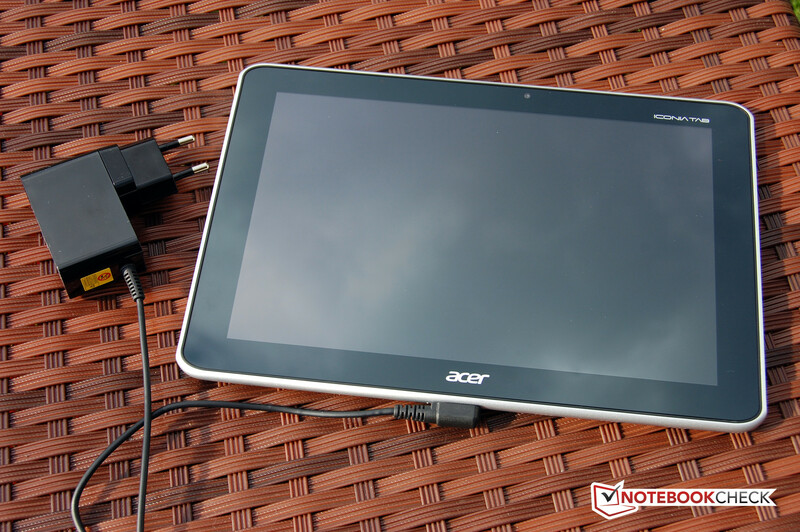 Thanks to the generously sized battery, the Acer Tab does not suffer from high power consumption. Under full stress the battery lasts almost a full 4 hours, which is very long. This is when the conservative design of the SoC clock pays off. In the practical WLAN surf-test, running a brightness of 150 cd/m2, the result of 06:58 hours is absolutely fine. Nevertheless, the device falls short of its potential in this area. With a 36-Wh battery there should be a far greater advantage. The maximum battery life with our browser-based reading scripts test, resulted in a time of 13.37, which is a very respectable contrast. The Acer Iconia Tab A700 can't quite live up to its high expectations. The data sheet of the Acer Iconia Tab A700 really grabbed our attention: high-resolution display, strong performing hardware and good components. Because of these things, the 10.1-inch device was actually a candidate for producing a really good score in our review - but in reality this was not quite the case. Despite numerous positive aspects, we still found things we had to criticize. This all began with the case of the tablet. While the build quality is flawless, the materials used and the overall stability leaves room for improvement. Next comes the quite heavy weight of the device, and it's fair enough to say this tablet is a little fat. On the visual side Acer is holding back, yet still leaving a good impression in our test lab. With the equipment we didn't have anything to complain about. In fact it was quite the opposite with a dedicated HDMI port and an adapter from micro USB to normal USB bringing added value. 32 GB of internal memory measures up to the required amount and can easily be expanded by using microSD cards. A 3G-module does not come standard with this device, but the similar Acer Iconia Tab A701 will and it should be following soon. We were excited about the display with a high-resolution of 1920x1200 pixels. While the color reproduction and viewing angles didn't give any cause for complaint, the 'IPS - like' display panel performance was only average in our lab tests. Particularly the low brightness of the display puts a hold on the potential fun of the tablet. Together with the highly reflective glass it makes using the tablet outdoors almost pointless. Controlling the Acer Iconia Tab A700 is simple and intuitive. Except for the occasional lag everything runs smoothly. The UI Ring is nicely executed and simple to use. The small load-up pause after hitting the button to bring up the ring did annoy us a bit. The performance tests showed us that the high-resolution of the display comes at a cost. In comparison to similarly equipped tablets the Acer Iconia Tab A700 normally performs weaker. Nevertheless there is still clearly a lot of power. One highlight of the Acer Tab is the speakers, and that's not something we usually say about tablets. Obviously the sound is not good enough for deep bass, but the sound produced is crystal clear and convincing. 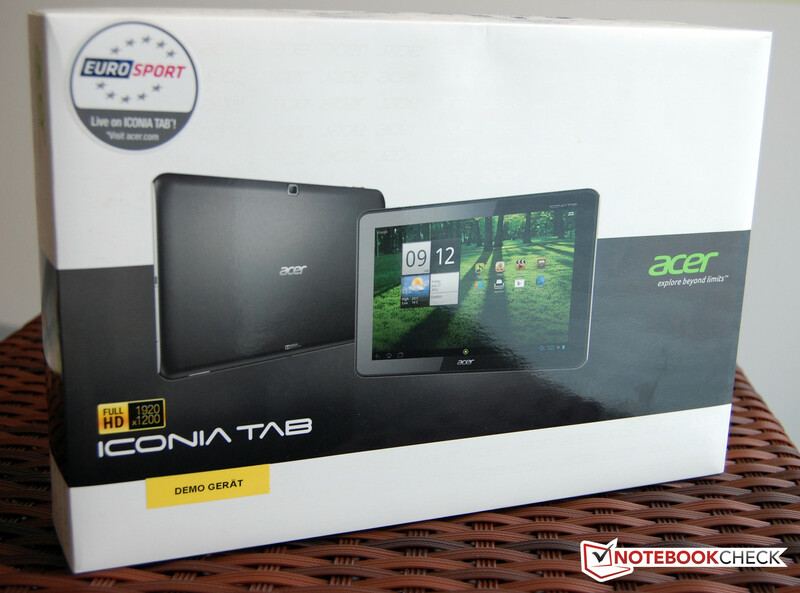 In summary, the Acer Iconia Tab A700 comes in with mixed results. The tablet performed well and earned some good results in the single factors, but the darker display helped to lower the overall impression. The Acer is still current next to the Asus Transformer Pad Infinity TF700T, which is the only other Android tablet with a full HD display. Also considering the Acer sells for 449 Euro (~$588) that makes it a lot cheaper than the Asus-flagship. Anyone who is looking for a comparatively cheap tablet with a high-resolution should definitely take a look at the Iconia Tab A700. Anyone else who is happy enough with a 'normal' display would probably be better served by a Fujitsu Stylistic M532. The box is nicely designed. The speakers serve the Acer really well. Above: Volume control, Screen rotation lock and mic. The rear facing camera fights a bit harder for quality, but still isn't winning. The front camera isn't good for much. The back side is made of rubberized plastic and gripping knobs. The A4 maunal helps begginers get started. The tablet has gotten relatively thick. We were pleasantly suprised by the quality of the speakers on the tablet, which enhanced the experience of watching movies. The picture quality was also very good. The display needs a higher brightness and the glass needs to be less reflective. This would greatly increase the tablet's mobility. The power consumption in off, standby and idle modes is very high. This is something Acer should really take care of. The Acer Iconia A700 tablet has to be measured up against other full-sized tablet competition. Currently these are the Fujitsu Stylistic M532, Asus Transformer Pad Infinity TF700T, Acer Iconia Tab A510, Samsung Galaxy Note 10.1 und Google Nexus 7.